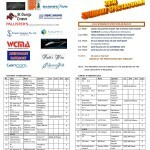 Come on down for an EPIC adrenalin packed day of Speedboat Racing! 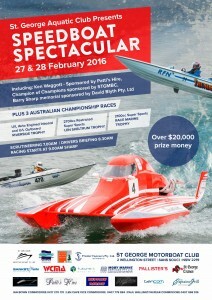 Witness some of our best drivers in Australia racing speedboats on the Georges River in South Eastern Sydney. The Aquatic Club ladies will be running the downstairs BBQ. Bacon and egg sandwiches, sausage sandwiches, pies, sausage rolls and other refreshments will be available throughout the day. All proceeds from the BBQ going toward helping the club. The new downstairs Cafe and downstairs bar will be open and all St George Motor Boat club facilities available. There is plenty of parking at the club and in surrounding streets, including disabled access. See you all there for a huge day!